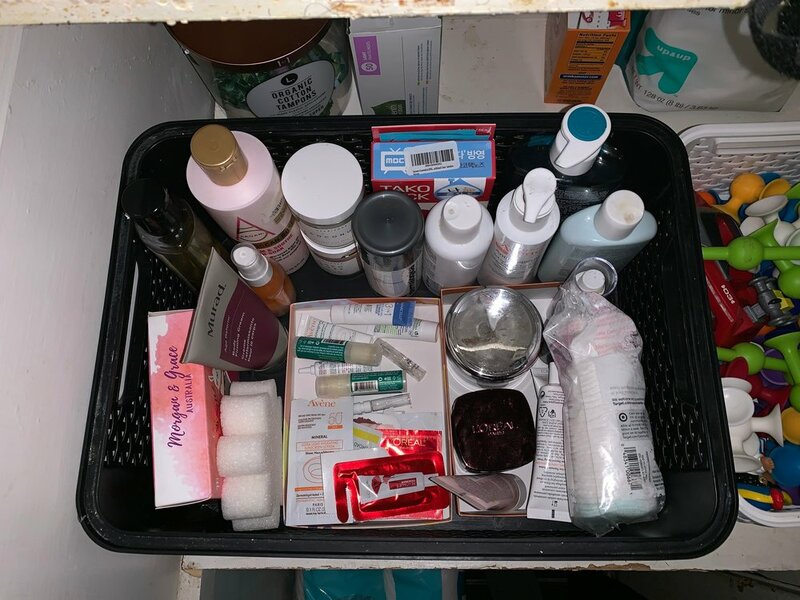 I knew my bathroom was going to be a mess but I had no idea that there was so much “stuff” in there that placed on the floor, I would no longer be able to walk. My bathroom is not massive, but it is also not small! It should have been large enough to contain the essentials. Our house was built in the 1930’s and has the black and salmon-coloured Art Deco tiling to match. The functionality of the washroom is vintage and so it can be difficult to organize “modern conveniences”. The toothbrush holders, for example, are in the wall tiling but our toothbrushes now a days are too thick to fit into the holders. There is a spot for a cup and also a bar of soap. Neither of those fit a hand soap container. So our soap sits on the counter and our toothbrushes were in a cup. Beside the sink, we have a radiator. Every couple months, someone knocks over the cup holding the toothbrushes and they all fall behind the radiator. Sometimes, we can reach them to be boiled and others, they fall into dust-bunny Neverland. Off to the store to buy yet another new set of toothbrushes! This is such a small thing but it’s so irritating. Especially when it happens at bedtime and then we have to share our toothbrushes (does anyone else do that or is it just us and now you think we’re super gross?!). Anyway, a solution had to be found. One day, we will renovate this bathroom but until then, we will have to make-do and deal with it as it is. I made a video about the clean up but here’s the before and after! Do minimalists make their kids use adult toothpaste so they only have one tube? How do they store their first-aid? What is a minimal amount of bandaids? Do toothbrushes sit in a cup? Where do they hang their towels? Surely not the back of the door! What does the bathroom of a minimalist with a lot of kids look like? Why do I have so many partially-used tubes of toothpaste? I still haven’t managed to get the closet down to little enough to put my towels into the linen closet, but I’m working on it! So for now, we go out to the hallway, hopefully before we’re in the birthday suit, to get the bath towels! The problem is largely in part to my skincare regime (the big, black box!). Also, the whole shelf of haircare. And then I took half of my husband’s shelf for my miscellaneous things. But I feel like if I put a couple Marie Kondo-style boxes inside of the bigger boxes, I could possibly get the shelves down enough to actually store our linens in there. The top shelf is off-season, pre-packed travel things, nail care and mouthwash. Until I get my skin troubles fixed (I have battled problem skin for many years) the skincare needs have to stay. As I said, this is a process. Let’s see where it’s at by the end of this year, shall we?! This isn’t the best way to store the skincare products, I’m sure, but it’s a start! If you have #TIPS on storing products- let me know in the comments below! Storage is obviously a problem. Also, how do ya like that bathroom?! Not exactly peaceful, white, Scandi-minimalist-looking, is it?! Also, there’s peeled wallpaper on the door behind the towels. Why?! Only Jesus knows. Not much difference, really. Still working on this part! Some rearranging may be in order. How do minimalists store their beach towels? Where do they keep their guest linens? Do minimalists actually just have a lot of closets? What does a minimalist house look like in the New York City area where everything is old and very expensive to remodel, especially when your husband isn’t super handy (he’s learning! ), and you have a lot of kids and need room for visitors who frequent often? Oh, yeah. Like this! Do minimalists make their kids make their beds? Next year we will discuss, “Getting those kids in order!”. We will see if this all gets changed (or stays sorted!) by the end of the year. I got rid of a lot of sheets and pillowcases we don’t use and immediately regretted it after because I like to make rag rugs- what was I thinking?! Come to think of it… it’s possible I can save them from the garage if my husband didn’t take them yet, but I fear he did. I’m sure there’s more in the basement, though. Wait until you see the attic. I did a sneak peek on Instagram in my stories, you can see it here! Get going on that washroom, I’d love to see YOUR pictures! Please use our hashtag #freshminimalism so I will be able to find your posts and repost them! I hope you’re feeling so fresh and so fine on this journey with me!